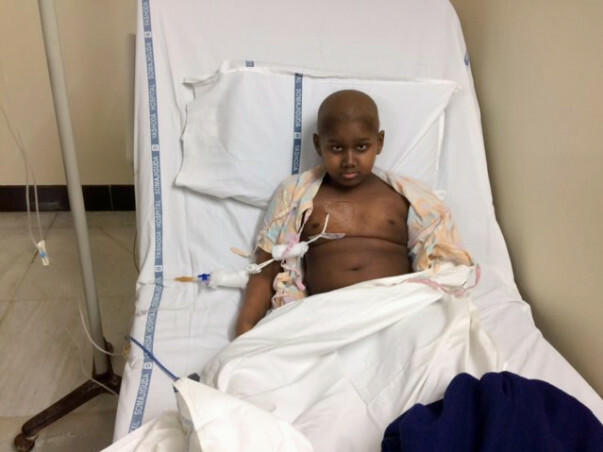 Joshik is a 9-year-old with Acute myeloid leukaemia – a blood cancer. His cancer is growing very rapidly and in just four months, his condition has worsened. Hoping to stop the cancer, a bone-marrow transplant (BMT) was done but it failed. Another BMT is his last chance of getting better. His parents are completely drained of resourced and need help saving Joshik. Shivmohan, is father, is a farmer who earns about 2 lakhs per year from his farm in Proddatur, Andhra Pradesh. After the diagnosis – Shivamohan decided that Joshik would not suffer simply because his father was poor. He sold off all that he could sell and took massive loans. Shivmohan put everything he had into arranging money for the first BMT. When Joshik's blood count did not get better – he was shattered. He has no resources left to arrange for a second BMT which might be Joshik's only chance to survive. Your contribution to this fundraiser campaign will give this hopeful, happy child a second chance to defeat cancer. We have some unfortunate news to share. We received news that Joshik passed away. His parents are devastated. This tough brave kid had fought the disease twice, however succumbed to a complication and could not make it. The funds will be utilized for this medical expenses so far as the family has spent a lot for his treatment. Please do pray that the family finds strength in this time of need and thank you for all the love and support you have shown this little one. Joshik was diagnosed with cancer and was undergoing his treatment for the same. 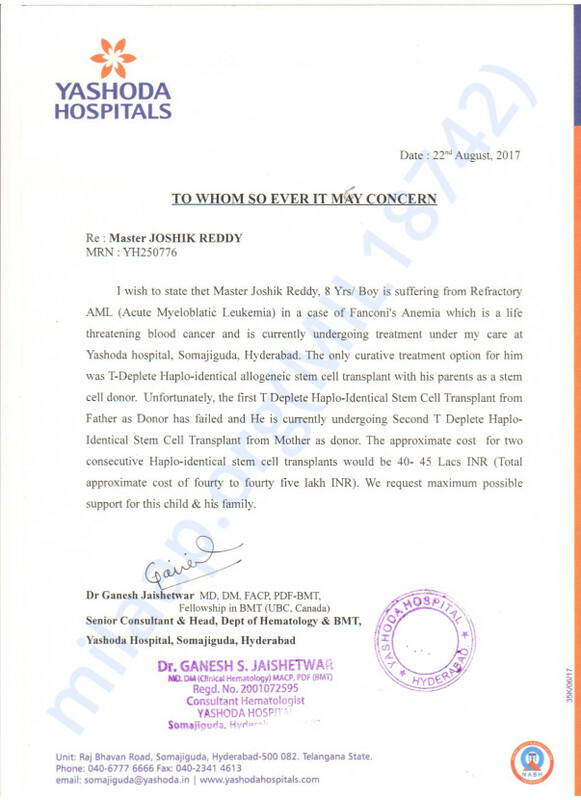 He had his Bone Marrow Transplant on 20th September. The doctors had kept him under observation for a few days. He developed a complication known as HLA complication and the doctors were treating him for the same. During the course of this treatment, he was being administered high doses of medicines to help him stabilize his health. He had side effects like hyperactivity, he was just talking and would sometimes forget what he was talking about and to whom he was talking to. We spoke to the father on 12th October and he said us that Joshik had developed fids and was shifted to the ICU for further treatment. Shivmohan, Joshiks father has left no stone unturned to provide his son with the best medical care. He sold off everything that he had to raise money for his son's treatment. He now needs your help to raise funds for his sons further treatment. Please do share this campaign as much as possible with your friends and family. 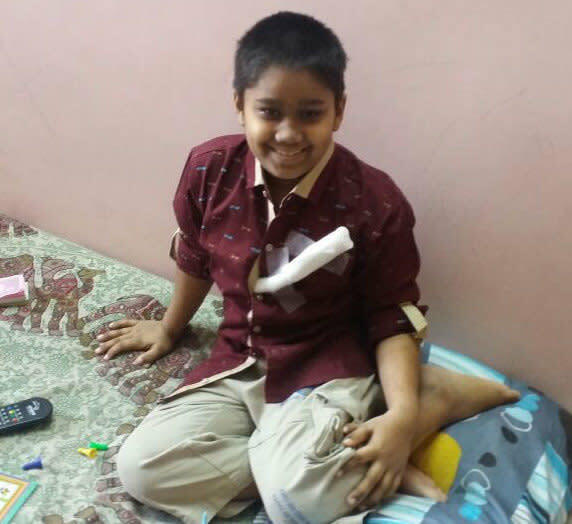 Your simple act of sharing this campaign can help Shivmohan move closer to his goal of helping his only son get the treatment for a better future. Your help has helped Joshik fight the battle till now and your support and blessings will help Shivmohan and Joshik continue the battle further against cancer. 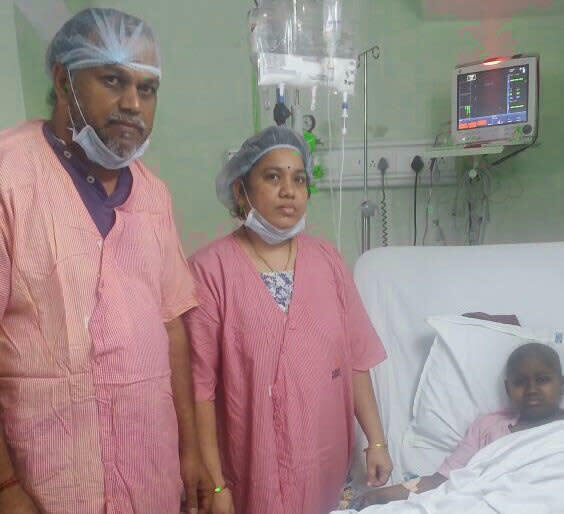 Joshik successfully underwent his Bone Marrow Transplant on 20th September. He is doing well and recovering slowly. Currently, he is admitted in the hospital for a viral infection. It was a side effect of the treatment but the doctors are positive on his recovery. He has to take an injection daily for sometime until the doctors advice otherwise.